NextWhat’s new, right now: Watergod and their otherworldly vision. Incredibly this year Pearl Jam have been in the news quite a bit thanks to their Rock And Roll Hall of Fame induction back in April. But while awards and accolades are an amazing honour, they have also been quite reflective, losing a great friend in Chris Cornell and heartbroken by what Stone Gossard recently referred to as “a seemingly endless string of heartbreaking events”, which last week accumulated with the tragedy that unfolded at Las Vegas. But while we reflect on the ongoing mess that surrounds us, we must not forget those things that inspire and give us pleasure. It is here that I want to put on record by saying I love Pearl Jam. I was there when they broke onto the music scene with Ten back in 1991 and two decades later I am still amazed by their output, humility and humanity. Most fans will agree with me when I say every live Pearl jam show offers something new and interesting. Their performances are electric and most have gone down in rock folklore as legendary. For fans unable to travel the world over, an amazing catalogue of bootleg recordings (put out by the band) highlight their astonishing shows where they rip through songs we almost always expect to hear as fans, with some amazing rarities and lesser known gems. 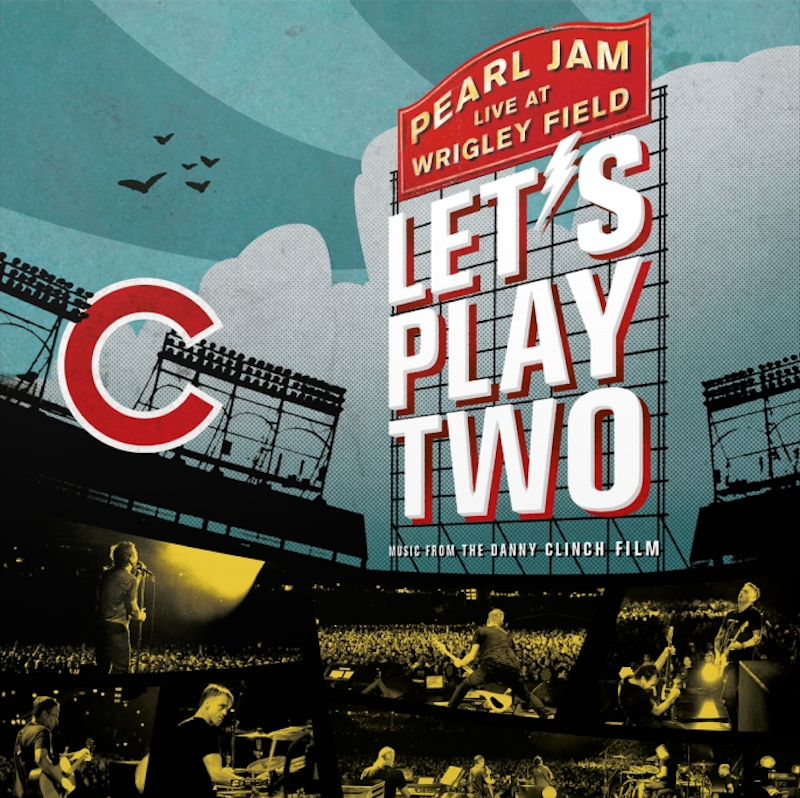 That said, Pearl Jam’s latest offering Let’s Play Two, the soundtrack and the live doco of the same name, is a celebration of the band’s two- night concert performance at Wrigley Field last August (2016). We will get back to briefly talking about the soundtrack in a minute, but firstly the concert film captured by big music fan, photographer and filmmaker, Danny Clinch is absolutely breathtaking. I cannot imagine not seeing this in the movie theatre last week. I was in particular truly stunned by Clinch’s use of the wide camera shots of the crowd, intercut with a thrilling display of showmanship that Pearl Jam seem to offer up everywhere they go, but probably more so here at Wrigley, given the special occasion that surrounded the Chicago Cubs historic 2016 season, winning the World Series after 108 years. That said, and you may already have guessed, this isn’t just a concert film. It is in a nutshell a story about Eddie Vedder’s long time obsession with the Chicago Cubs. Like all suffering Cub fans, Eddie has learned to embrace the good and the bad (mostly the bad) when it comes to his beloved Cubs. We come to see very quickly that it’s not always about winning, but the journey that comes with being a loyal fan. (In a real PJ fan moment, Clinch deftly intercuts nostalgic footage of Vedder wandering around Wrigley in 1992 which feels surreal.) We also get a glimpse of the inner sanctum of the Cubs home Wrigley Field and the many backstories and faces of superfans and locals, which includes the amazing people from the sports pub Murphy’s Bleachers. Despite my indifference about baseball (being an Australian) I still love any good sporting story of the underdog overcoming the odds. The rest of the band is also very cool about allowing Eddie the luxury of indulging in his fandom, particularly onstage. But what the film also does well is allow us as Pearl Jam fans to indulge a little with our own obsession with them. As a fan it’s really nice to see some of the rare moment of their camaraderie, especially on the rooftop of Murphy’s Bleachers, in a Beatleseque performance. It goes without saying that I love live albums, and in this case, the soundtrack to this stunning live doco that we have briefly touched on. I cannot really do it any justice by giving a track-by-track account, you will just simply have to listen to it yourself. Having said that the songs from the soundtrack are not necessarily in the order of the two shows from Wrigley Field, on the night of the 20th & 22nd August 2016, but a collection that nonetheless showcases their amazing abilities. On this live album PJ make many of their greatest songs even today still sound relevant and enjoyable for any fan of alternative rock. The soundtrack allows us to reminisce with hits like Black, Jeremy, Given To Fly and Alive. It is also worthwhile repeating myself here by saying that Corduroy stands as one of my favourite PJ songs of all time, from their third album Vitalogy. For me, it is always a surprise to hear it live and it never fails to give me goosebumps even here on Let’s Play Two. I also quite like that Inside Job sneaks in ahead of some of the songs that didn’t make the soundtrack (I wont name them), again one of my favourite songs of all time, that I often play for its sentiment and of course inspiration. A cover of The Beatles’ I’ve Got A Feeling closes the album. It is magical for me, in particular, because I am a huge Beatles fan, but also because of PJ’s fondness to play or incorporate in some way anything by The Beatles. Such is Eddie Vedder’s love for his beloved Cubs and the magnetic pull to perform at Wrigley Field, that Vedder happened upon a pair of buskers, as he exited the stadium, long after the conclusion of a Cubs game last month (Cubs beat Mets 14-6), for an impromptu performance. It’s fair to say, our buskers were absolutely thrilled, as were a lucky few who managed to capture the street performance outside Wrigley Field in Chicago that night on September 15th 2017. It’s moments like these that makes my admiration for Vedder easy. His sincerity with musicians and fans alike, is quite simply second to none! Photo Credit: The header image of the Let’s Play Two soundtrack is courtesy of Monkeywrench, Inc. I make use of it under the rationale of fair use because no free equivalent seems to exist and serves as the primary means of visual identification at the top of my article dedicated to the review in question. I am not the uploader of You Tube clips embedded here. I have been thinking of getting this and now I think I will. I have been in to live albums lately, so this seemed like it might be good. Glad to see that it is. Thanks. Great stuff. Look forward to catching this at some point soon. I only recently rewatched another Danny Clinch Pearl Jam film I bought a few years ago. It’s called ‘Imagine in Cornice’ and is a docu-film of PJ’s tour of Italy (around 2006ish, I think). I don’t know if you’ve seen that one – it’s pretty good, and sounds like it’s very similar to the new one. Another fantastic and well-written review Robert. I watched the DVD last night. Not being fortunate enough to be able to go see them live, the way the concerts were captured are the next best thing. Also, I love the composition of the film, the way it integrates the Cubs championship with the concert. I also love the way the director captures the love affair the fans and PJ share with each other, especially Eddie. There is almost a religious feeling about it. Thank you so much for your excellent review.